Penn Treaty Park is at 1341 N. Delaware Avenue in Philadelphia’s Fishtown section, about one-and-a-half-miles upriver from Penn’s Landing on the Delaware River. Traditional accounts say William Penn’s peaceful treaty with the Lenni Lenape was negotiated on land now occupied by the park. 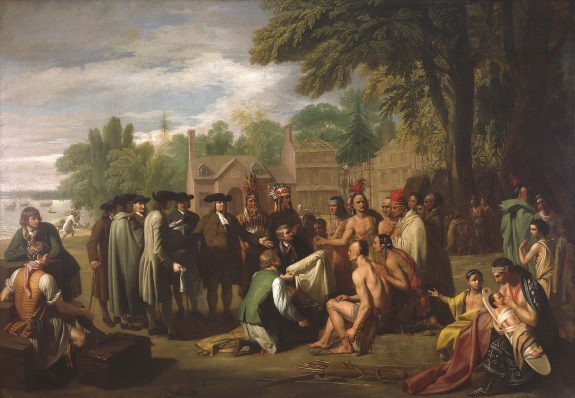 The iconic event is depicted as Benjamin West imagined it in his painting Penn’s Treaty with the Indians. The site of the agreement was said to be marked by the Great Elm, located to the right in the image. The original elm fell during a storm in 1810, and two hundred years later, in May 2010, a descendent elm was planted in its place. Though no first-hand evidence of the treaty exists, West and other artists have contributed to the legend through their art, and the park’s establishment helped perpetuate it as well. 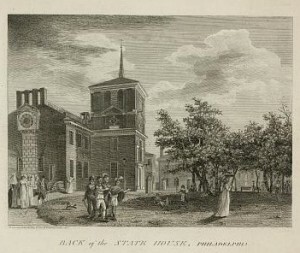 William Birch created this engraving of the Pennsylvania State House in 1799, when Philadelphia still served as the capital of the United States. A visiting delegation of Native Americans can be seen in the foreground of the Pennsylvania State House (later known as Independence Hall). By this time, the original steeple on the State House had deteriorated and had been removed. 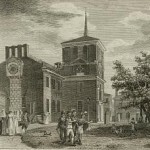 The U.S. Congress met in the County Court House (late known as Congress Hall) at Sixth and Chestnut Streets and a house at Sixth and Market Street served as the home and office Presidents Washington and Adams. 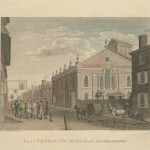 In his series of prints, Views of Philadelphia, published in 1800, William Birch sought to capture the architecture and sights of early republican Philadelphia. 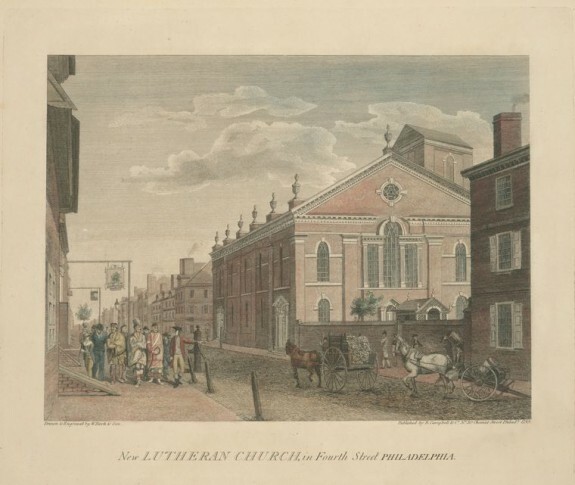 In this print, Birch drew the New Lutheran Church on Fourth and Cherry Streets from a vantage point across the street and a half block away. In the foreground, horses pull carts down the street and several men, both European Americans and Native Americans, walk together in a large group down the sidewalk. Birch’s drawing suggests that Native Americans were part of Philadelphia’s culture and that mingling between the two groups was a fact of daily life. Renowned Seneca chief Sagoyewatha, who fought along with other Haudenosaunee (Iroquois) for the British during the American Revolution, received the name “Red Jacket” from the scarlet coats he habitually wore. In his dealings with the new American republic, he excelled as an orator and negotiator, always resisting any encroachment upon ancestral lands or Native customs and beliefs. In March 1792, Sagoyewatha led a delegation of Haudenosaunee to meet with George Washington in Philadelphia. Sagoyewatha supported the Americans during the War of 1812, but after participating in several battles, he proposed that Native Americans fighting on both sides withdraw from the war. Especially proud of the large peace medal that President Washington presented to him, Sagoyewatha was rarely seen without it, and it appears in the image that Charles Bird King painted in Washington in 1828. 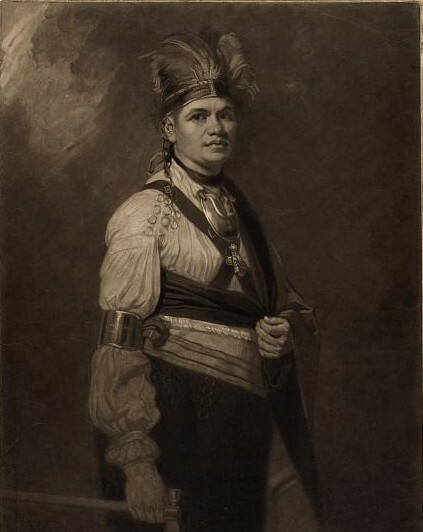 Mohawk political leader Thayendanegea, also known as Joseph Brant, was born in 1743 along the Cuyahoga River and was one of the best-known Native Americans among European colonists in the late eighteenth century. An educated and well-connected man, Thayendanegea became an asset to the British Crown during the Revolutionary War and served as a spokesman for the Mohawk, helping to negotiate land deals in return for loyalty to the crown during the upcoming war. 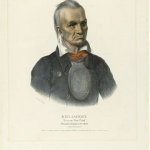 After fighting alongside the British, he settled in Canada on the Six Nations Reserve, where he continued his involvement in politics until his death in 1807. From the arrival of Europeans in the seventeenth century through the era of the early republic, treaties were an important tool in diplomacy between native nations and colonial Pennsylvania and later the nascent federal government. Treaties followed indigenous modes of diplomacy, into which colonists introduced, and imposed, the signing of treaty documents. However, treaty councils did not always culminate in a signed document. Indeed throughout the colonial period the term treaty described the process of negotiation and diplomacy, regardless of what such meetings produced. Most famous in Pennsylvania was the legendary treaty of Shackamaxon negotiated by William Penn (1644-1718) and Tamanend, which produced no written record. In the colonial period, treaty councils took place in Philadelphia as well as native and colonial towns within and beyond the growing colony like Shamokin, Conestoga, and Lancaster. Treaties that secured large swaths of land for Pennsylvania at times occurred outside the colony, as with the Albany Purchase of 1754 and the New Purchase (1768) and Last Purchase (1784), both of which occurred at Fort Stanwix in New York. In 1758, at Crosswicks, Lenapes ceded rights to most of their lands in New Jersey to that colony’s government. Councils were formal affairs steeped in native diplomacy, particularly Iroquoian ceremonies. As negotiators came together, they participated in the Wood’s Edge Ceremony, which acknowledged and ritually cleansed the arriving party from the perils of their journey and opened the lines of communication. Over the ensuing days, or often weeks, Pennsylvania officials and native leaders exchanged speeches, gifts, and strings of wampum. While chiefs and colonial officials were key players, more often than not it was skilled orators who conducted negotiations, aided by interpreters. Metaphorical language, compelling voice and gestures, and command of an audience were all key to being a skilled native orator. Interpreters and intermediaries, or go-betweens, who relied on their trustworthiness excelled when they could translate not only between languages but also the cultural nuances that inflected negotiations. Colonial scribes recorded speeches from the interpreters and created minutes for treaty councils that offer historians a glimpse of the process and rhetoric of negotiation. In the early decades of colonial settlement, treaties were often small local gatherings consisting of a few dozen participants. As the eighteenth century progressed, councils grew in size so that several hundred attendees would swarm the treaty grounds. At the Treaty of Fort Stanwix in 1768, commissioner Sir William Johnson recorded 2,200 native participants as the council opened. The vast concourse of spectators at treaties was important to the process itself, for native diplomacy relied on a notion of consensus. Indigenous onlookers became participants as they signaled their assent or discontent at the speeches that made up formal negotiations. The struggle for consensus also played out away from the formal and public arena as native leaders, officials, and intermediaries deliberated and worked out their differences in private. The search for common ground could protract the process, and treaty councils sometimes lasted for weeks. While diplomats and intermediaries worked toward agreement on the issues at hand—land and boundaries were common concerns, but trade and, most importantly, war and peace spurred negotiations—colonial and native spectators busied themselves as well. Councils attracted traders of victuals, cloth, tools, munitions, and accessories. There were times for feasting, singing, dancing, and playing games. By all accounts, native diplomats seemed impressed with their interactions with the Quakers, likely attributable to the Friends’ professions of peace and fraternal harmony in a period when Indian-colonist violence was foremost in the minds of native ambassadors. Quaker authority declined in Pennsylvania during the eighteenth century, however, as did their formal role in Indian-colonist negotiations. Indeed, following the Paxton Boys’ war to drive all Indians from the Susquehanna region, the belief that Quakers elevated native interests above those of backcountry colonists helped oust the “Quaker party” from the colonial assembly. 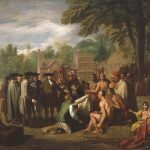 Nevertheless, treaties of colonial officials with local Indian nations and Iroquoian nations dominated the colonial period even as relations between natives and the Pennsylvania government deteriorated—at times due to treaties themselves. Pennsylvanians’ crafty dealings in the 1737 Walking Purchase displaced and alienated their Lenape neighbors. By the time the federal government ensconced itself at Philadelphia in the waning days of 1790, treaty negotiations in the city became more diverse and less conclusive. President George Washington (1732-99) and Secretary of War Henry Knox (1750-1806) were deeply concerned with Indian relations in Iroquoia, the Ohio country, and the southeast, rather than in Pennsylvania, where relatively few native people remained. Indeed, delegations to the city in the early 1790s primarily concerned the developing war in the west, where confederated nations of the Ohio country defeated the American army in 1790 and again in 1791. During the capital’s tenure in Philadelphia, two dozen delegations arrived in the city to negotiate and fortify their ties to the federal government. While only the Cherokees signed a treaty in Philadelphia in these years, negotiations at the capital preceded or followed treaties elsewhere in the country. Visiting diplomats hailed from many nations, including Creeks, Choctaws, Chickasaws, and Cherokees from the south; Wyandots, Delawares (newly residing in Ohio country), Ottawas, Chippewas, Potawatomies, Eel River, Weas, Kickapoos, Piankashaws, Kaskakias, Miamis, and Shawnees from the west; and Mohawks, Senecas, Oneidas, and Onondagas from the north. Like earlier treaty councils, formal speeches, or talks, formed the core of negotiation between delegates and the federal government. 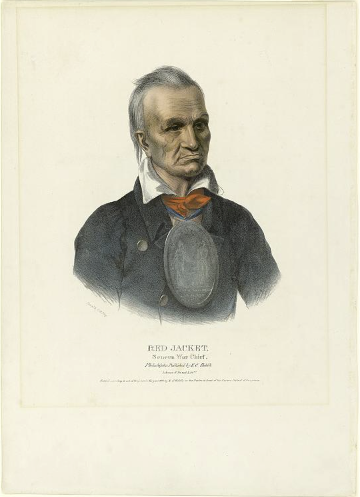 The Seneca Red Jacket (c.1750-1830), was among the most famous orators (native or white) in the early republic, and his speeches from treaty councils were recorded and published in newspapers around the country. However, negotiations in the capital were much smaller than those from earlier decades. The largest visit in the 1790s consisted of forty-nine Iroquois who attended Philadelphia in 1792, though no treaty was signed at the conclusion of negotiations. However, the average was fewer than a dozen. Deliberations with the president and secretary of war were protracted, with days sometimes intervening between the exchanges of talks, prolonging negotiations, as in the past, over weeks and sometimes months. During that time, native negotiators toured many cultural and civic sites, such as theaters, museums, churches, and the new waterworks. Several of the iconic prints of William Birch (1755-1834) captured native visitors moving about the city. As they negotiated the urban landscape, diplomats engaged with Philadelphians informally in streets and taverns and in more formal meetings with members of the Quaker Indian Committee and local and foreign dignitaries. Through these meetings long-standing relationships were solidified and new ones forged between the Friends and distant nations like the Creeks and Cherokees. Gifts and hospitality remained crucial to the treaty negotiations, as reflected in President Washington’s 1792 address to Iroquois diplomats “that during your residence here you should be well fed, well lodged and well cloathed, and that presents should be furnished.” Gifts varied but almost always included clothing and other textiles, and guns and ammunition were common. Cast in large lots at the mint in Philadelphia, medals were a ubiquitous gift to indigenous diplomats. Rank determined the size of medals that the diplomats received, as the most prominent leaders received the largest medallions. With the transfer of the federal capital to Washington in 1800, Philadelphia’s role in treaty negotiations diminished. Nevertheless, native people continued to come through the city on their way to and from Washington, often to exchange talks with Quaker allies and to take in the sights of one of the nation’s most vibrant cities. Stephanie Gamble received her Ph.D. from Johns Hopkins University in 2014 for her dissertation, “Capital Negotiations: Native Diplomats in the American Capital, 1789-1837,” and is the author of “A Community of Convenience: The Saponi Nation, Governor Spotswood, and the Experiment at Fort Christanna, 1670-1740,” in Native South (2003). She is a Learning Specialist at the University of Kansas Libraries and is working on a history of Native speeches and cultures of diplomacy in the capitals of the early American republic. Calloway, Colin G. Pen and Ink Witchcraft: Treaties and Treaty Making in American Indian History. New York: Oxford University Press, 2014. Densmore, Christopher. Red Jacket: Iroquois Diplomat and Orator. Syracuse, N.Y.: Syracuse University Press, 1999. Gustafson, Sandra. Eloquence Is Power: Oratory & Performance in Early America. Chapel Hill: University of North Carolina Press for the Omohundro Institute of Early American History and Culture, 2000. Jennings, Francis. The History and Culture of Iroquois Diplomacy: An Interdisciplinary Guide to the Treaties of the Six Nations and Their League. Syracuse, NY: Syracuse University Press, 1985. Prucha, Francis Paul. Indian Treaties: The History of a Political Anomaly. Berkeley: University of California Press, 1994. Shannon, Timothy J. Iroquois Diplomacy on the Early American Frontier. New York: Penguin, 2008. Vaughan, Alden T. Early American Indian Documents: Treaties and Laws, 1607-1789, Vol. 1 (Pennsylvania and Delaware Treaties, 1629-1737), Vol. 2 (Pennsylvania Treaties, 1737-1756), Vol. 3 (Pennsylvania Treaties, 1756-1775). 20 vols. Washington, DC: University Publications of America, 1979-2004. Wainwright, Nicholas B., ed. “George Croghan’s Journal, April 3, 1759 to April , 1763.” Pennsylvania Magazine of History and Biography 71 (1947): 313-444. Minutes of Indian treaties and conferences, 1721-1760, 7 vols., American Philosophical Society, 104 S. Fifth Street, Philadelphia. Indian Papers, 1746-1788, 22 vols. ; Cadwalader Family Papers, 1623-1962; and Conrad Weiser collection (various electronic resources), Historical Society of Pennsylvania, 1300 Locust Street, Philadelphia. A Treaty of friendship held with the chiefs of the Six Nations, at Philadelphia, in September and October, 1736 (Philadelphia: B. Franklin, 1737), along with various other published proceedings, Library Company of Philadelphia, 1314 Locust Street, Philadelphia. Penn Treaty Park, with historical marker, 1314 N. Delaware Avenue, Philadelphia. Fort Pitt, Point State Park, Pittsburgh, Pa.